Andrew Jaquith considers 8 hypotheses, and for each provides diagnostic questions. A great read. The network perimeter is porous, permitting easy access to any outsider. An outsider can readily obtain access to internal systems because password policies are weak. Once on the network, attackers can easily obtain administrator credentials. An intruder finding a hole somewhere in the network could easily jump straight to the core transactional systems. Workstations are at risk for virus or worm attacks. Viruses and worms can spread quickly to large numbers of computers. Application security is weak and relies too heavily on the “out of the box” defaults. The firm’s deployments of applications are much riskier than those made by leaders in the field (for example, investment banking). An excellent article on CSO Online written by Andrew Jaquith for on where CISOs should focus their efforts at securing data. Instead of trying fruitlessly to be the enterprise's all-knowing content guardian, censor authority, and compliance guru, the CISO devolves responsibility of these activities to the business. IT security becomes a clearinghouse for data security tools that business groups can use as they see fit. Responsibility for classifying information and restricting its flow is ultimately a business challenge, not a technical challenge. How documents, spreadsheets, and emails are used depends on workgroup and business unit preferences. So it is with data security. That means that inside counsel owns email eDiscovery and retention, product engineering owns CAD drawings, and finance owns accounts and earnings projections. These groups know who should and should not have access and what should happen if their assets are misused. IT security's primary role should be to help source, design, and install the technical controls in place that will enable them to express and enforce their compartmentalization needs—not to be the gatekeeper. The high-priority update will fix the flaw which is reported to work on multiple platforms (Windows, Mac, Linux). David Omand, former director of the UK's Government Communications Headquarters, released a study about the need for government-level digital surveillance. Among the more troubling of his statements is his view that "finding out other people's secrets is going to involve breaking everyday moral rules." His vision of preemptive surveillance includes monitoring of "databases of airline bookings, advance passenger information, financial, telephone, tax, health, passport and biometric records and phone and internet communications." Can you have data security without physical security? I hope you know the answer for your particular facility in light of this research project from the University of California San Diego called "Sneakey." Sneakey is a software which can create a physical duplicate of a key from a digital image. In an experiment conducted from 195ft away, the researchers were able to take a digital photo (zoom lens) of a key chain and match all 5 bitting codes (the indentations on the keys), enough to be able to create a duplicate key. The survey also showed that 1/3 of the respondents who rely on the services of a tax preparer were not at all concerned about the possibility of becoming victims of identity theft when choosing their preparer. An additional 23 percent were somewhat concerned and only 18 percent were very concerned. Small and medium sized businesses are often at a loss when it comes to the threats they face and the mitigation strategies they should pursue. While written by a security vendor, GFI, the nine-page document is a worthwhile read for any SMB. The key to making corporate systems safer does not only require investment in software or hardware security products; very often more knowledge, awareness and a better understanding of existing security policies would be enough to reduce the risk of malware infection, data leakage and fraud. The security firm Finjan has released their latest Cybercrime Intelligence Report. Cybercriminals used affiliate networks to boost their malware and rogueware distribution, using Search Engine Optimization (SEO) techniques to drive additional traffic, and thus revenue. In this case, they made $172,800 in 16 days. Investigating a number of bomb threat hoaxes targeting several college campuses (including Boston College, Purdue University, Clemson University, University of North Carolina, and Florida State), police found that the suspect then used internet-accessible webcams at each campus to monitor the response from law enforcement at each campus. Meanwhile, the real victims - people who suffer from identity theft, lost time, or credit fraud - get a nice little letter telling them 'We made a mistake and it's your problem to clean it up. Have a nice day.' To me, the banks and payment companies who are suing each other and finger-pointing are a side-show; they're in business and are simply incurring an unexpected cost for mistakes made. Let's not overlook the victims: real human beings. -- Marcus Ranum, CSO Tenable Security. For all the browsers on operating systems, the hardest target is Firefox on Windows. With Firefox on Mac OS X, you can do whatever you want. There’s nothing in the Mac operating system that will stop you. The quote is from Pwn2Own hacker Charlie Miller, interviewed by ZDNet's Ryan Naraine. Charlie was the first to break into a Safari browser running on a (patched) MacBook. Leave it to the folks at SRI International to publish one of the best writeup on the workings on the worm and its impact on honeynets where it takes over as the dominant infection. They also just recently updated their Conficker worm analysis (see direct link to addendum below). Why Conficker has been able to proliferate so widely may be an interesting testament to the stubbornness of some PC users to avoid staying current with the latest Microsoft security patches. Some reports, such as the case of the Conficker outbreak within Sheffield Hospital's operating ward, suggest that even security-conscious environments may elect to forgo automated software patching, choosing to trade off vulnerability exposure for some perceived notion of platform stability. This news article reports on a recent CanSecWest presentation by researchers from a company called InversePath into two different methods of sniffing keyboard activity from 50ft away, one using a laser (w/ line of sight to a laptop), the other from signals emanated from a PS/2 keyboard plugged into a grounded outlet (via PC apparently). If you've ever been curious as to what information went into a credit card number, this is a good read. It provides enough details to be able to create a simple program to validate credit card numbers. Depending on the source (Gartner vs Forrester), security spending is anywhere from 5% to almost 12% of IT expenditures. According to this article from The Register, "a reliably exploitable IE vulnerability now fetches $100,000 on the black market." While the dollar figure itself may be debatable, one fact isn't: most hackers are in it for the money, the rest are security researchers. At the Pwn2Own 2009 competition, "Nils", a student from the University of Oldenburg in Germany, was able to compromise Safari, IE8, and Firefox. "Virtually any internet-facing software can be proven vulnerable to real-world exploits." Gentlefolks, start your virtual machines (for an extra degree of protection). If you're in the software development or security, one of the questions you should be asking is which cryptographic algorithms are still safe to use. Why? One reason is because with every passing year, CPUs get more speed and are now multi-core, memory gets bigger, networks get more bandwidth. The other is because researchers find flaws and vulnerabilities - some are due to implementation errors, but others stem from the algorithms themselves. So, if you're wondering if you should still be using MD5 hashes or 256-bit RSA encryption, go read this document for security's sake. In the first weeks of the trial a security expert managed to pay using someone else's fingerprint. I wonder what the Crossover Error Rate was for this Tip2Pay fingerprint reader system. Jon Leibowitz, FTC Chairman, warned companies that they must "protect their back doors from hackers, malware, spyware and other high-tech intrusion mechanisms and protect their front door by properly storing and disposing of consumers' data." He indicated that FTC will not be shy about knocking on a company's door to evaluate their practices. Speaking at the "Securing Personal Data in the Global Economy" conference on March 16, 2009, he also said: "Without adequate data security there really is no privacy." It has the hallmarks of a real story, usually starting with "At least 12 people have been killed and more than 40 wounded in a bomb blast near market in..." However, don't be fooled by this message claiming to be from the Reuters news agency (it is not) which seems to be based on a story similar to this BBC news report (dated March 6, 2009). The fake news report contains a link to a web site which then customizes the story based on your IP address and serves your machine with the Mal/WaledPak-E (aka Packed.Win32.Krap.i) malware. An apparent break-in at an office in the College of Arts and Sciences at the University of Toledo, Ohio yielded more than just a computer: university officials will also be notifying 24,000 students about FERPA data exposure (student ID # and grades). More troubling is that the stolen computer also had data on 450 faculty, including names, birth dates and SSNs. The personal data was saved on the computer itself and not on the university's network, which officials are encouraging staff to do. A university official claimed that the "computer was password protected and many of the files were specifically encrypted or individually password protected." However, as security professionals caution about, using "password-protected" documents (i.e. MS Word, MS Excel, PDFs) is not considered strong protection as this "protection" can easily be cracked or bypassed. Managing Information Technology (IT) doesn't have to be boring. This blog post from Kevin Behr manages to connect IT management (focus on automation) and Piggly Wiggly, a chain of grocery stores mainly in the Southern US. Anyone who's had the opportunity to hear, read, or talk to Michael Santarcangelo, founder of Security Catalyst, knows him for his focus on people side of information security. In this interview with CSO Online, Michael has some tips for security professionals to help them get executives and boards to understand and approve spending decisions in these tough economic times. This is as controversial as it gets. As part of a news media show called "Click", the British Broadcasting Corporation (BBC), ran a story about cyber security in which it controlled a botnet of at least 22,000 computers. It used the botnet to send spam (to their own account) and to perform a Distributed Denial of Service attack (DDoS) with permission of the site owner. Once done with their experiment, the BBC "warned users that their PCs are infected, and advised them on how to make their systems more secure" by modifying their desktop background. They may have violated the UK Computer Misuse Act by sending spam. They may have violated laws by conducting a DDoS attack. They may have violated laws by changing content on compromised machines (i.e. zombie machines part of the botnet), in this case modifying the desktop background image. For those who still believe that physical security is not a big issue with respect to data security, this illustrated tutorial can help you see the light of just how easy it can be to change the password for the root account on a Linux machine. Assumptions are that the machine is not encrypted and can be rebooted (usually trivial to reboot a machine if you are sitting in front of it, i.e. physical access). To be of value, the method of measurement employed should be reproducible, that is, capable of attaining the same result when performed independently by different competent evaluators. The result should also be repeatable, such that a second assessment by the same evaluators produces the same result. Relevance and timeliness are also implicit considerations, since it is of little benefit to have measures that are not meaningful or whose latency exceeds their usefulness. Note: only an experienced Information Security Professional can make an actual SPPD diagnosis. The Security Patch Procrastination Disorder is characterized by a general complacency towards the deployment of security patches. In its most extreme form, it is often accompanied by delusions that patching is simply not required for secure IT operations. When this behavior continues during widespread reports of critical patches, it is referred to as Acute Security Patch Procrastination Disorder or ASPPD for short. SPPD often starts as a benign case of FSOS, or False Sense Of Security, often resulting from unprotected and unmitigated contact with vendor-based security marketers. If left untreated, FSOF eventually erupts into full-blown SPPD (see list of symptoms below). If diagnosed early by an Information Security Professional, SPPD can be treated with simple, but regularly scheduled applications of COTS patches, also known as Commercial-Off-The-Shelf patches. If after appropriate information security evaluation and reassurance the condition persists, the entity is likely to suffer debilitating cases of JBH, or Just Been Hacked, often accompanied with MSG$, Must Spend Gazillion Dollars. user education should be approached like a marketing exercise -- if users are nodding off, it will never be effective. The information security community needs to get more creative in educating users about the dangers facing them in this web 2.0 world. How about a series of books and cartoons portraying the average users and the mean hackers? 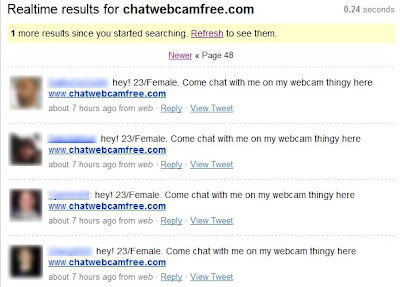 Who's better at thwarting phishing attacks, men or women? According to a recent study, neither. Both men and women are equally susceptible to fall for a phishing attack. 23% of people will fall for (i.e. believe in) a spear phishing (i.e. targeted phishing) attack. Attacks written with an authoritative tone are 40% more successful than those offering a reward (bribe). The SCMagazine article has several interesting points from Joshua Perrymon, CEO of PacketFocus: “We see around 70 percent response with directed attacks.” Perrymon also cautioned that cultural differences will impact the phisher's success: in the US, China, and Japan, authority is seldom challenged, a trait that the phishers can use to their benefit. I've had the good fortune of following Didier Stevens on Twitter for a few months and his research into various software flaws is nothing short of amazing. Didier has managed to demonstrate without a doubt that the latest Adobe PDF Zero-day flaw can trigger an attack even without user intervention. The culprit is one of the many things that your machine does in the background, in this case, the Windows Indexing Service (WIS). In order to index the contents of a PDF file, WIS needs to process it. Yet, the code responsible for processing the PDF is itself vulnerable to this latest attack, which leads to the compromise of a process running with local system privileges. If by some chance you still believe that no harm can come to you from operating (or failing to detect) a Peer-to-Peer (P2P) network, then please read one of these posts if you have any kind of sensitive data about other people. Organizations vary in their cultures. We expect, then, to find different cultural approaches to security management that apply to each organization [...] An important indicator as to the success of the security role is whether or not the protected population are inclined to comply with security controls, or work around them. Also, do they [users] feel like they can and should approach the security personnel when something looks awry. I want a devil on my nuclear submarine [...] I want an entrepreneur in my consultancy and hospital. On a nuclear submarine the devil will be respected, but the entrepreneur will be less trusted or tolerated. In a consultancy, the response to the personalities will be reversed. Posted by Chris Cronin in a SANS/GIAC discussion thread about good security (and reprinted with permission). Good security will almost always make peoples' jobs harder. There is no need to make their jobs harder "just because we can." -- John Mark Allen, posted earlier today on SANS GIAC Advisory board mailing list, in reply to a somewhat heated discussion about security enforcement (reprinted with permission of the author). I would also like to point the reader toward another related post by Dave Shackleford on "Practical Intelligence" in Infosec, dealing with the need to work with users instead of against them. When someone faces the prospect of losing a job, they will do anything to ensure their family is fed and supported. Unfortunately, that includes doing things detrimental to their careers like stealing company information. It's our job to have the policies and security controls in place to protect our organizations and save people from themselves. -- Mark Weatherford, CISO for the State of California, and a member of the SANS NewsBites editorial board. Most successful initiatives are run by a senior executive who reports to the Board or the CIO of an organization. These executives lead a group that we call the Software Security Group (SSG), charged with directly executing or facilitating the activities described in BSIMM. BSIMM is written with the SSG and SSG leadership in mind. This is an important body of work with input from representatives of Adobe, EMC, QualComm, Google, Wells Fargo, and Microsoft. The document is licensed under the Creative Commons Attribution-Share Alike 3.0 License (for license details, go to http://creativecommons.org/licenses/by-sa/3.0/). In February 2009, the federal government was presented with a new report identifying strategic objectives for improved cyber-security. Produced by the Institute for Information Infrastructure Protection (I3P), the report examines the cyber-security challenges facing the economic, physical, and human infrastructures and called for making cyber-security a national priority. People must be engaged as a positive force to improve cyber security. Information security systems must be easy to use by non-IT professionals; awareness and education campaigns must be directed at the public and private sectors; and security training should be taught in schools. Earlier today, I had the chance to read an email that Forrester's Andrew Jaquith had posted. I asked him if he would share some of this early research with the rest of the community and was happy to see that he did. Mining the information contained in the the DatalossDB, Andrew found that while laptop-related breach reports grab the headlines, they often only cover a fraction of the number of records related to server breaches. Arbor Networks has blogged about a phishing attack that uses the fact that IE does not use (or believe) the Content-Type tag returned by an HTTP response and instead tries to detect MIME types on its own. In this case, phishers are using that to come up with content that only renders in IE browsers. It's no secret that 2009 is promising to be a tough year for nearly everyone. With corporate budgets shrinking, companies are looking to reduce costs by cutting the workforce and/or the number of projects planned/funded. Yet, reports indicate that cybercrime and data breaches have reached new highs, and that organized crime is growing rapidly in the shadows of the digital age. However, this atmosphere of gloom may be just what the doctor ordered. With less money to spend on security staff and technical controls, companies will have to make do with what they have: people and data. 2009 will be the year of going back to basics and corporations should focus on people and data by creating a company-wide risk management committee involving representatives drawn from leadership positions across every line of business. As Tony Hildesheim, vice president of IT for Washington State Employees Credit Union, said, their risk management committee "goes further in providing increased security awareness, and therefore improved security overall, than any tool we have implemented." For those companies that find themselves holding an unacceptable level of risk, the popular security controls of 2009 are Data Loss Prevention (DLP), Full Disk Encryption (FDE), and Web Application Firewalls (WAFs). While I've always wanted to write something like this, Aaron Hughes, President and CEO of IAC SecureTech and President of Vidoc Razor, beat me to it. A quick read but definitely worth it. 3. Of course it is secure - the (Military/Law Enforcement/Government) uses this, so it has to be…. The sophistication and automation of financially motivated cybercrime is very steep today when compared with counter-efforts... Criminals are agile and able to outpace the rate of adoption of counter-technologies in the marketplace. On March 1, 2009, NBC's Natalie Morales reported on Nightly News about the dangers that Peer-to-Peer (P2P) software users face. The family they interviewed used a P2P program (still popular with the teenage crowds) which, unbeknownst to them, was leaking tax return information onto the P2P network. There are two ways that P2P programs can lead to data leakage; one is due to user misconfiguration, the other due to software flaws. The first is somewhat easy to fix: if, after learning about the dangers of P2P programs, you still find a need to use them, be sure to configure the software so that does not share your entire hard drive but only designated files and folders. The second aspect, software flaws, is something the entire software engineering and information security community have been trying to solve for several decades with no end in sight. However, this story opens up another worrisome aspect related to taxes, that of the small and medium sized CPAs and tax accountants all over the country who are charged by their customers to figure out their taxes. Tax returns are rich with personal information and need to be appropriately secured. Next time you drop off your tax records, ask how your information will be protected. If instead you find yourself doing your own taxes, be sure to safeguard any data files and/or PDF documents you generated by either encrypting these or storing them off of the main computer (e.g. in a safe, preferably encrypted as well). This article discusses the various avenues available to an Information Security Officer (ISO) who has just discovered that an employee has been visiting "naughty sites and saving certain files locally." The utility of this article is in the subtleties of each of the options available to the ISO. Every ISO should read it. Waledac now has another weapon to lure users into installing it: geolocation-based ads. This feature is used to serve what appear to be local ads or coupons which in turns increases the appearance of being a valid service. As a faculty member, one of my hopes is that I can make a difference in the lives of the students that I get to have in class. A former student, now clearly on his way to a successful career in Information Security, said to me just this week: "I probably wouldn't be in this field [infosec] if not for your classes." Getting to see this student mingle with various infosec professionals and knowing that I had something to do with it is its own reward. Why Do Bad Things Happen to PCI-Compliant Companies? This article dates back to 10/24/2008, yet in light of the recent breaches including Heartland Payment Systems, is still very much on topic. Src: Why Do Bad Things Happen to PCI-Compliant Companies? It seems a military contractor has allowed a file containing sensitive data about Marine One to be shared over a Peer-to-Peer (P2P) network. The file was tracked making its way to an IP address in Iran; it contained highly sensitive blueprints for Marine One, including details about the helicopter and avionics packages. With the proliferation of "sharing" technologies such as P2P and Sharepoint sites, the need for Data Leak Prevention (DLP) is growing. While DLP solutions are still maturing, entities housing sensitive information should take another look at what is running inside their networks and start looking into what's leaving their networks as well. Many of these sharing technologies are often used by regular users as opposed to being setup and managed by IT, following a documented process, and with a documented business need. This often leads to misconfigured setttings allowing too much access to information.